Two half sheet records scanned as one record. Woelk, William R. ; McGillis, Roderick L. ; Ouellette, George J. 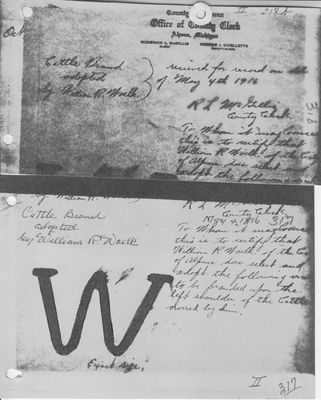 Cattle Brand adopted by William R. Woelk. [signed] R. L. McGillis County Clerk. this is to certify that William R Woelk of the City of Alpena does select and adopt the following mark to be branded upon the left shoulder of the cattle owned by him. [brand design of a large W] exact size.